It’s easy to tell which TV show The Huntsman: Winter’s War director Cedric Nicolas-Troyan never misses an episode of. There are so many odes to HBO’s Game of Thrones in this sort-of-sequel to Snow White and The Huntsman that, by about half-way through, you start expecting to witness the resurrection of Jon Snow. What’s harder to tell is just who this film is for. It’s done in the vein of a classic fairytale, but it definitely isn’t for kids. On the other hand, there probably isn’t enough blood, gore, and shirtlessness for most GoT fans. Colleen Atwood’s costumes are incredible (HBO wishes they had that kind of wardrobe money) and Emily Blunt wears an impressive number of them, but it’s hard to argue that the clothes are reason enough to see a movie. 1. The film’s goblins are a negative of GoT’s White Walkers—wordless, angry, humanoid beasts capable of great feats of killing and death stuff. 2. Blunt’s character Queen Freya dons a magical mask to see through the eyes of an owl just like Bran Stark does with his raven. 3. Here’s an army riding around in a frozen wasteland. A GoT-style winter is coming. Freya brings it. 4. Yes, there’s an ice wall, and yes, like the Wildings before them, the Huntsmen climb it. 5. Damn. Looks like Cersei was split in two and given a wardrobe upgrade. 6. And who does this one think she is? Ygritte? 7. Aw, remember when Ygritte (RIP) and Jon Snow (RIP x 2) had their own romantic cave bath? Sara and Eric? Same. 8. The night is dark and full of terrors, much like evil Queen Ravenna’s gown. 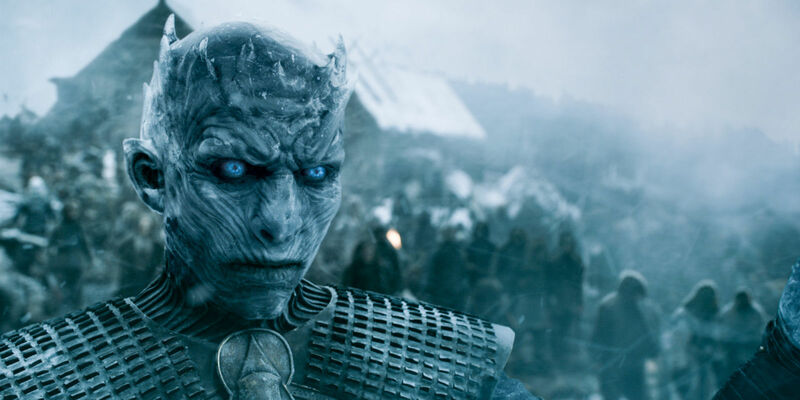 Game of Thrones returns to TV on April 24. The Huntsman: Winter’s War is in theatres today. Check out the trailer below.